The Riebeek Valley offers a multitude of activities to explore, however; from top-class restaurants, to nature walks, cycling, wine and olive tasting and so much more. The Funky Fresh Market is held 1st Saturday of each month and is located opposite Potpourri and is well known for fresh tasty treats and funky handmade goodies which has been going for the last 14 years. Also the Groen Rivier Food & Craft Market every Sunday from 11 am to 4 pm across the road at the famous wedding venue. Ideal for the whole family and lots of activities for the children. Located 5km from Riebeek Kasteel, Potpourri is linked to one of the town’s most active and well-sought after Art Galleries in the area which attracts visitors all year round. Riebeek Kasteel offers the best of country shopping. Quaint stalls and markets line the streets on Saturday mornings and the rest of the Riebeek Valley offers a multitude of activities to explore; from top-class restaurants, to nature walks, cycling, wine and olive tasting. Of which, the famous Olive Festival is held at the beginning of every May and sees incredible turn-outs of wine and olive lovers each and every year, making this the event to be at in the valley, no matter where you’re from! The Berg River Canoe Marathon brings much needed outdoor fun in the middle of chilly July, The PPC Berg Marathon attracts runners from all over during August and weekly country markets and art exhibitions held within Riebeek Kasteel are often buzzing with both locals and visitors to the beautiful Valley. Over and above our beautiful rooms available, we also boast with an intimate and completely private garden en-suite cottage with kitchenette – great add-on for additional privacy. 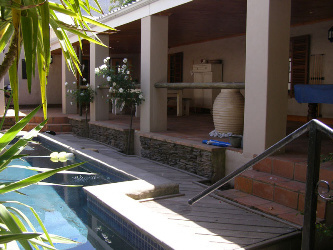 An outside lapa with braai facilities, mini bar counter and stools offers the greatest area on the property during summer to relax with friends and a drink. The Lapa can also be used for small functions up to 60 people. Furthermore, a safe outdoor Swimming Pool surrounded by lush garden with an aviary and Koi ponds adds to the country life atmosphere. View our Gallery here.